On March 17, co-operators from across our region gathered at Greenfield Community College in Greenfield, MA, for the Seventh Annual Meeting of the Neighboring Food Co-op Association (NFCA), “Building an Inclusive Economy: The Co-operative Difference.” The meeting brought together 140 representatives from more than 50 food co-ops, start-up initiatives, and partner organizations. Keynote speaker for the day was Doug O’Brien, President and CEO of the National Cooperative Business Association, CLUSA International (NCBA CLUSA), who presented the organization’s vision for a more inclusive economy, inviting input from attendees on how co-ops can mobilize their shared strength to empower people in our own communities and around the world. In addition to reports from the NFCA Board of Directors and Staff, networking opportunities provided space for peer-to-peer dialogues on healthy food access and inclusion, using technology to compete, board development, and communicating impact. Afternoon workshops shared successful strategies growth, creating strong, resilient boards, and tools for membership development. O’Brien emphasized that today’s challenges are also opportunities for cooperatives to demonstrate the key strengths of the business model. He identified cooperators already working to impact their communities by meeting unmet needs, incorporating sustainability into their business practices, providing 21st century infrastructure and anchoring communities. Whether as credit unions, home care professionals, rural electric cooperatives or food co-ops, cooperatives continue the tradition of making communities stronger and more inclusive because of their uniquely member-focused business model. Elections chair Joanne Todd (Board, Willimantic Food Co-op, CT), announced the election of David Durfee (Wild Oats Co-op, MA), Neomi Lauritsen (Springfield Food Co-op, VT), and Chris Whiton (Littleton Food Co-op, NH) to the NFCA Board of Directors. Continuing on the Board of Directors are Katharine Arnold (Buffalo Mountain Co-op, VT), Kari Bradley (Hunger Mountain Co-op, VT), Faye Conte (City Market/Onion River Co-op, VT), John Crane (Portland Food Co-op, ME), Sue Miller (Upper Valley Food Co-op, VT), and Michael Wells (Putney Food Co-op, VT). Faye Conte, NFCA Board Chair and President of City Market/Onion River Co-op, thanked outgoing Board Members Suzette Snow-Cobb and Joanne Todd for their service and named Roger Noonan, President of the New England Farmers Union (NEFU) with the 4th Annual “Neighboring Co-operator” award, acknowledging his leadership and advocacy for our region’s farmers and producers in DC. Individuals and organizations are invited to make a tax-deductible contribution in honor of Roger Noonan to the Bowers Fund, which supports training and education for food co-op staff, managers, and board members: www.cdf.coop/nfca. As we anticipate the new growing season in the Northeast, we can still enjoy the bounty of local vegetables for healthy family meals. Your local food co-op has the ingredients you need for making soups, stir-fries, and special meals including our frozen fruits and vegetables to keep it local and easy to prepare. And during the month of May, our Northeast Grown frozen products will be on sale at participating food co-ops — a great time to try them if you haven’t already. Your local food co-op works hard to support our local farmers. And by working together, food co-ops across our region are making regionally grown produce available to our shoppers year ‘round. 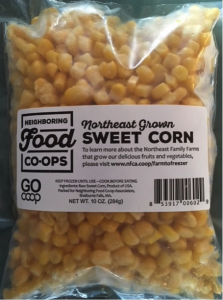 In 2017 alone, food co-op shoppers have purchased over 9,000 pounds of Neighboring Food Co-op Association (NFCA) Blueberries, Organic Broccoli, Organic Edamame, Organic Green Beans, and non-GMO Sweet Corn — all grown and packaged right here in the Northeast, and available only at your food co-op! “We are pleased to have a sale on all NFCA frozen products during May. It’s a great time to try them and stock up before the fresh season’s harvest is available,” says Suzette Snow-Cobb, NFCA Sourcing Coordinator. For more Farm to Freezer information and recipes — including a frittata recipe great for spring family celebrations using frozen corn, broccoli, or edamame — visit: www.nfca.coop/farmtofreezer. The food co-op movement began in the 1800s as a way for people to work together to obtain pure, affordable food. In keeping with this legacy, the Neighboring Food Co-op Association (NFCA) has been focused on addressing food security in our own time through Healthy Food Access initiatives such as “Food for All,” which working to ensure that people in our communities with limited incomes have access to healthy food and membership in their local food co-ops. 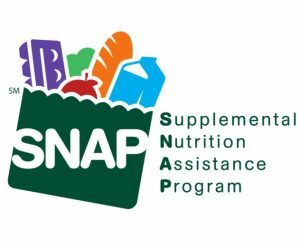 Recently, the Board of Directors and General Manager of the Hanover Consumer Co-operative Society, which operates the Co-op Food Stores in New Hampshire and Vermont, took a stand against proposed federal budget cuts to the Supplemental Nutritional Assistance Program (Better known as SNAP, or food stamps). The letter also noted that Co-op Food Stores’ ‘Food for All’ program offers eligible shoppers an additional 10 percent more value for their SNAP dollars and, later this spring, will offer ‘Double-Up Bucks,’ enabling recipients to double the buying power of SNAP purchases for fresh, local produce. Around the nation, the current SNAP program bringsnutritional benefits to vulnerable people while spreading the economic impact of SNAP purchases among many retailers. Looking for a great, local cheese to welcome Spring? Go Co-op and pick up Cabot Clothbound Cheddar cheese at your Neighboring Food Co-op. In 1992, Cabot Co-operative joined forces with Agri-mark, a southern New England Co-op dating back to 1918. Today the combined cooperative includes more than 1,200 member farms in New England and upstate New York. 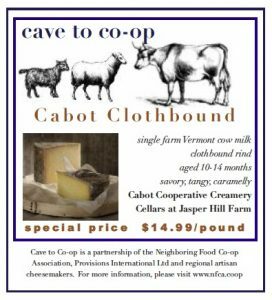 In 2003, Cabot Creamery asked Jasper Hill Farm to age a special batch of English-style clothbound cheddar. This was the beginning of a revolutionary partnership. Cabot Co-operative Clothbound Cheddar is best enjoyed on its own with a slice of crisp apple or pear. It has all the characteristic texture of an English-style bandaged cheddar; smooth and dense, slightly brittle, with the sweet caramel and milky flavors that set it apart from other clothbound varieties. It is simultaneously sweet, savory, nutty and tangy. 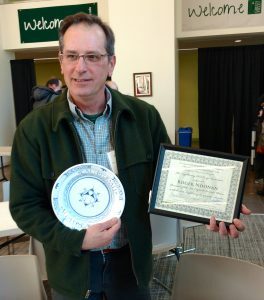 At the Neighboring Food Co-op Association’s (NFCA) Seventh Annual Meeting in Greenfield, MA, Roger Noonan, President of the New England Farmers Union (NEFU), received the annual “Neighboring Co-operator” award in recognition of his leadership and advocacy for our region’s farmers and producers before policymakers in DC. In addition to his role as President of NEFU, Roger Noonan is an organic farmer in New Boston, NH, where he operates Middle Branch Farm, a diversified family farm with operations ranging from maple syrup, greenhouse, and organic vegetable production to organic hay and forage crop production, livestock production and on-farm composting. He is a founding board member of Local Harvest CSA, a co-operative of eight organic farms. Roger has been an acknowledged national leader in helping family farmers navigate the new Farm Safety Modernization Act (FSMA). Roger is a regular attender at NFCA annual meetings where he provides updates on legislative issues and opportunities for food co-ops and their members to partner with producers on policy issues. He also presents regularly at NFCA’s annual Co-op Track of workshops at the NOFA Summer Conference. Individuals and organizations are invited to make a tax-deductible contribution in honor of Roger Noonan and other recipients of the Neighboring Co-operator Award to the Howard Bowers Fund, which supports training and education for food co-op staff, managers, and board membersLwww.cdf.coop/nfca. If you care about where your food comes from and and want to support the people who produce it, consider joining NEFU as a Friend of the Farmer. 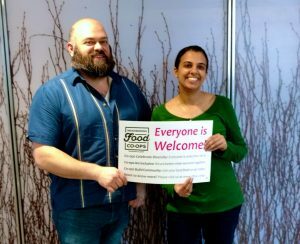 Your membership will help ensure that our region’s producers and consumers are heard by policy makers here at home and in Washington, DC — and individual members of NFCA Member Food Co-ops can join at a special discount. For more information, please visit: www.newenglandfarmersunion.org.